Situated on the West Coast of Mexico, Riviera Nayarit & Puerto Vallarta are becoming Mexico’s new hot spot vacation destinations. Fly into Licenciado Gustavo Diaz Ordaz International Airport, ideally situated between both beautiful beach cities. A quick 15 minute drive northwest will bring you to Riviera Nayarit, where you will find something for everyone and a short drive south will bring you to Puerto Vallarta where history, culture and nature surround you. Banderas Valley is the name early Spanish settlers gave to Puerto Vallarta, but today Vallarta has transformed from its silver mining boom to become a world class tourist destination. Named “World’s Friendliest City” by Conde Nast in 2001, Puerto Vallarta is one of the most sought-after destinations in North America and located on one of the most beautiful bays in the world. 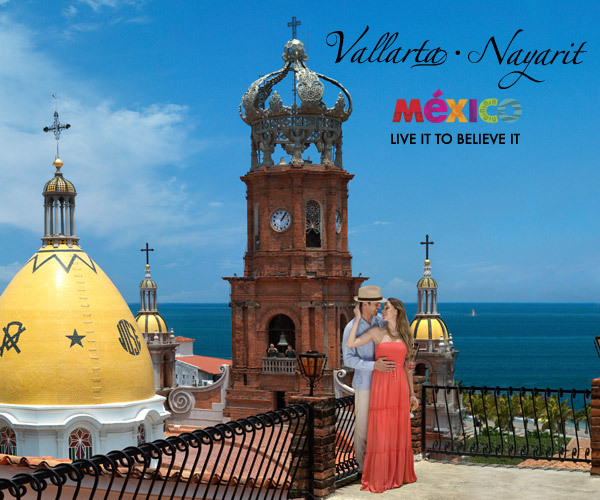 If you’re looking for an authentic Mexico experience Puerto Vallarta is the place for you. Take a stroll down the Malecón, Puerto Vallarta’s half-mile promenade that lines the city’s historic center and waterfront. There you will find a bunch of cafés and nightclubs, as well as the famous open air sculptures. At night the city really comes alive. Late night restaurants, live music, bars and nightclubs transforms the Malecon into the “IT” place to be. Puerto Vallarta is one of those destinations that doesn’t disappoint with things to do. Whether you’re looking for a relaxing day at the beach, a walk through the historic city, shopping at the Cuale Rivier for souvenirs of turquoise or opal, unique orchids and wildlife at the Botanical Gardens; Vallarta is simply a playground of activities that are never ending. Good food is not only important to you as a traveler but it’s important to Vallarta as well. Puerto Vallarta prides themselves on having a variety of award winning food through the city. So bring your appetite because you’ll need it. Besides being a famous tourist destination, Riviera Nayarit first became famous for the thousands of Humpback Whales that come to Banderas bay every year. Areas such as Nuevo Vallarta and Punta Mita offer unrivaled look out spots for visitors to see this giant mammals in action. If you’re not into animal watching and are looking for something more active, Riviera Nayarit offers luxury golf courses, marinas, shopping and so much more. Explore the unique little towns of Nayarit where each town offers something a little different.